The modern Italian kitchen resembles restaurant kitchens in many respects. 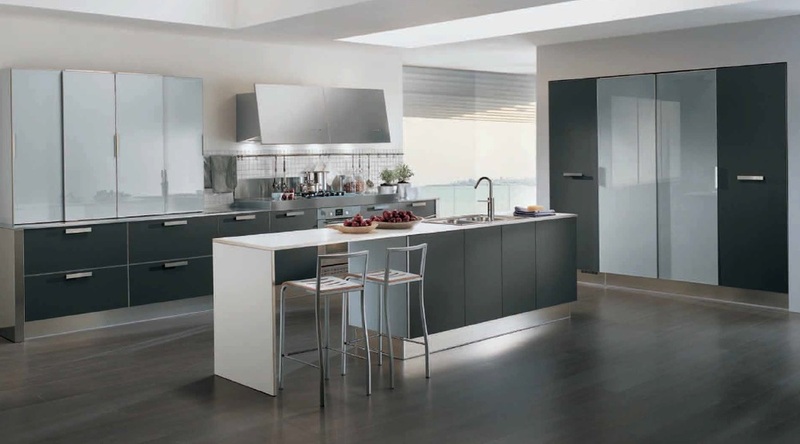 For example, stainless steel is often used, and the designs are minimalist and sleek. The island is the hub where all parts of the kitchen’s working zone are accessible at any time. Islands work well in both large and small kitchens. Well-designed modern Italian kitchens are so beautiful, that they often look amazing even when combined with a living and/or dining room. Convenience- How you will use your island in your kitchen once it is remodeled? While all parts of the kitchen’s working zone can be placed within the island, you may only select a few elements based on your family’s preferences and lifestyle. For example, if you love the fact that your kitchen sink is currently under a window, you may want to omit it from the island; especially since rearranging pipes and plumbing can be costly. If you have young children at home, you may refrain from placing the stovetop within the island for fear that they may reach over from a stool and burn themselves. For most people, the working zone is the center of the kitchen so it is ideal to contain the oven, a sink and even a chest of drawers within the island. Color- A design trend of recent years has been to select an island’s finishes that are different than the rest of the kitchen’s cabinetry. While the color and finishes of the island can be different than the rest of the kitchen, they should complement each other. A contrasting combination between colors, for example white and blue, or black and red, has become very popular. The use of light colors in the contrasting combination will create an airy sense of freshness. The use of warm colors will prevent the space from appearing cold and dreary. Community- The island will be a place where family and friends gather often, so make it comfortable. Choose bar stools with high backs on them for maximum comfort. Many of today’s islands look like stunning furnishings in kitchens large and small. They offer conveniences that will make preparing meals easier than ever. By selecting the right one, you will experience joy not only when passing your favorite recipes down from generation to generation, but just by sharing a conversation and cocktail with a dear friend. Creating a masterful design for a kitchen often comes from the minds of homeowners who envision something better. The kitchen is the center of most homes and therefore it can add a tremendous amount of value to give it an update. Popular television shows and magazines make it seem so easy to redesign a kitchen, with the latest in kitchen appliances, kitchen building and décor materials. Yet, very often things go terribly wrong when an inexperienced homeowner attempts to design a new kitchen. Here is a list of the top kitchen design mistakes that people make, that can ruin a good kitchen, with advice on how to avoid them. Lack of a design layout – One of the biggest problems with re-doing your own kitchen is not understanding the golden rule of kitchen design - the triangle layout. Each kitchen is comprised of three important elements that include the sink, stove and refrigerator, which should be positioned with the least amount of obstruction. Unfortunately, too many homeowners focus on their counters and cabinets and forget about where they plan to have these appliances, turning their kitchen into chaos. Covering up structural faults – As part of any kitchen design process, most people will start tearing out certain elements of their kitchen. In doing so, they may discover problems with the walls, the floors, electrical wiring, plumbing, and other structural features of their kitchen. An inexperienced home designer will just cover them up, which can be a big mistake that can cause damage later on. A quality home designer will recommend repair of these items before laying the foundation of a new kitchen. Forgetting traffic flow of the kitchen – Depending on your lifestyle, the kitchen can be the hub of activity for your family and friends. Being able to walk through the kitchen and get to the activities needed is critical to the best contemporary kitchen design. A mistake often made is forgetting to map out the traffic areas when planning a new kitchen design; an oversight that causes years of frustration. The wrong storage approach – In many homes, particularly those that are small, the kitchen is also not roomy enough for storing necessities. A mistake that do-it-yourselfers often make is just trying to add some more shelves to a random wall or building a standalone pantry. This doesn’t fit in well with any kitchen, and could put a strain on the walls of the kitchen. Instead, consult with a kitchen design firm to build cabinets and storage for your kitchen that is beautiful and functional. Using poor quality materials - Designing a kitchen can be a costly venture for most, but it’s worth the investment as it can raise a home’s value by as much as 20 percent when handled by a contemporary kitchen design firm. However, if you try to cut corners by using cheap materials, the kitchen will look bad and your home’s value will drop. Use durable kitchen materials that are sustainable and will make your home look great. Inadequate countertops – Every kitchen needs to have enough countertops to provide ample cooking and entertaining space. Most kitchens in older homes and apartments don’t have enough countertops, therefore the homeowner may just add new ones overtop the old counters. But this doesn’t make the kitchen better, it just perpetuates a bad experience in the kitchen. Instead, have a kitchen designer create an island countertop to expand the usable space for your kitchen. Lack of lighting options – Kitchens of today are spaces where both natural and electric light shine, creating a focal point for the home. Many homeowners forget this, and opt for tiny ceiling lights instead of opening up the space and using natural lighting and enhanced surface lights. Hire a professional kitchen designer to provide contemporary lighting styles that will make your kitchen more illuminated. As you begin to plan for the redesign of your modern kitchen, be sure to call on the professionals at Berloni America for support. A functional kitchen is an organized kitchen. A hot idea for this year’s contemporary kitchen design is the addition of new organization systems. By making the kitchen more functional, home owners can enjoy the freedom to use their kitchens knowing all dinnerware, cookware, and other kitchen elements are in the proper place. For a smaller kitchen, this can be a plus because it opens up the kitchen space for other purposes like entertaining and spending time with family. Some of the contemporary kitchen designs include organizational systems that fit neatly into kitchen drawers and cabinets. By using customized and adjustable organization trays, racks, and shelves; the kitchen is more convenient to use. Learn more about Berloni organization solutions for your contemporary home. Drawer organization solutions. In the kitchen, drawers can quickly become overfilled with a variety of cooking tools and accessories. To get control of the clutter, it’s important to install drawer organizers that are right for each individual use. Choose from eco-friendly wood drawer organizers that are shaped to fit utensils and silverware. For deeper drawers, plate racks and adjustable organizers can create more space for plates and cookware. Cabinet organization shelves and racks. As part of a kitchen upgrade, you may decide to make your cabinets and shelves more spacious with custom racks. Use them to hold plates, glasses, barware, pottery, and various types of cookware for fast access to the things you need to make each meal complete. Shelves can be built to suit any type of cabinet, providing an extra layer of storage and organization in your contemporary home. Custom container organization. In order to keep foods, condiments and spices fresh, you may choose modern in-drawer storage solutions that use customized kitchen containers. These containers fit neatly into kitchen drawers, in cabinets, and on shelves where you need them. They are stackable and come in a variety of contemporary European inspired designs and colors. Use labels or special color combinations to maintain order in your kitchen. Wall and pantry organization options. The pantry can be a good place for storing anything from food staples to extra cooking tools, therefore having access to organization can maximize this space in the kitchen. Organization solutions can include stainless steel and quality reclaimed wood racks built into cabinets or shelves that provide ample space for anything you need to stow away. As part of our kitchen update, you can experience more by adding new kitchen drawers and cabinets that make the most of your space. Putting things within reach and ease of use is what makes the modern kitchen appealing to today’s savvy home owner.